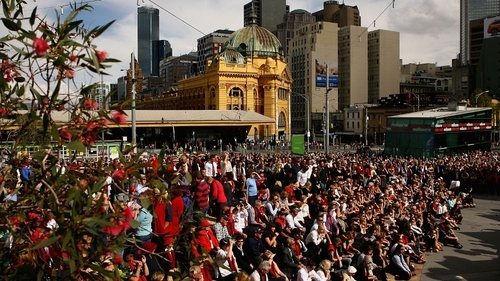 The funeral of Dublin-born Australian Rules legend Jim Stynes, who died last week after a long battle with cancer, has taken place in Melbourne. The 45-year-old was honoured with a state funeral in Victoria, where he spent his life after leaving Ireland aged 18 in 1984. Up to 5,000 people turned up at Federation Square in the city to watch a live televised broadcast of the service from St Paul's Cathedral. In a eulogy, his younger brother Brian, who won all All-Ireland senior medal with Dublin in 1995, spoke movingly about Jim's calls home when he moved to the other side of the world, and how the family would gather around the phone once a week to speak to him. "He was a big, generous and fun older brother and we all adored him," Brian Stynes said. Concluding his speech, Brian said: "I tried following in his footsteps, but they were always too big." In his eulogy, Jim's former Melbourne team-mate Garry Lyon heaped praise on Jim's ability to overcome adversity. "Consistency was a cornerstone of Jim's footie career," he said. He added: "I owe it to Jim to be consistent today, and he'd be disappointed if I didn't take the chance to have a laugh at his expense." Mr Lyon went on tell some "home truths" about his old friend's frugal attitude to financial matters. "If he wasn't tight with his money, he was very careful with it," Mr Lyon said, drawing laughter from the congregation. After the funeral, the cortege stopped as it passed the Melbourne Cricket Ground, where Mr Stynes plied his trade for over a decade. He will be cremated, and his ashes will be brought back to Ireland to be scattered. Jim Stynes was recruited in the mid-1980s by the Melbourne AFL club and went on to become decorated as the first international player to win the sport's highest honour, the Brownlow Medal, in 1991. Before he left Ireland, he won an All-Ireland minor football winners’ medal with his native county in 1984. The captain of that team, Paul Clarke, attended the funeral, along with GAA President Christy Cooney. Jim Stynes, who was a giant ruckman, holds the AFL record for the greatest number of consecutive games at 244 - over 11 years. He played a total of 264 matches for the Melbourne Demons after making his senior debut in 1987. But his stature went beyond his on-field deeds as he took over as Melbourne chairman in mid-2008 when the oldest AFL club was in dire financial straits and steered them to financial stability. He was awarded an Order of Australia in 2007 and was Victorian of the Year in 2003. Mr Stynes fought an inspirational public battle against cancer over more than two years, undergoing some 20 operations, including many to have brain tumours removed. Last night, hundreds of people attended a memorial mass for Mr Stynes in south Dublin. Among those who attended the service at Ballyroan Church, in his former home parish of Ballyroan, were the Australian Ambassador to Ireland, Bruce Davis, the Director General of the GAA, Páraic Duffy, and former GAA player and manager Colm O'Rourke. During the service, memorabilia, including a number of footballs and jerseys, were brought to the altar. A musical piece was also played by Finbar Furey.